What is it about a water garden that draws us to it? The dewy dripping of a fountain or the texture of the plantings? Perhaps it’s when we see fish in it and we hover over the water to watch them, feed them. Somehow, I think the Garden of Eden must have had a water feature. I‘ve carried this water garden pot around with me whenever I move. It’s small enough and portable enough to just pick up and go and then easily set it up again. 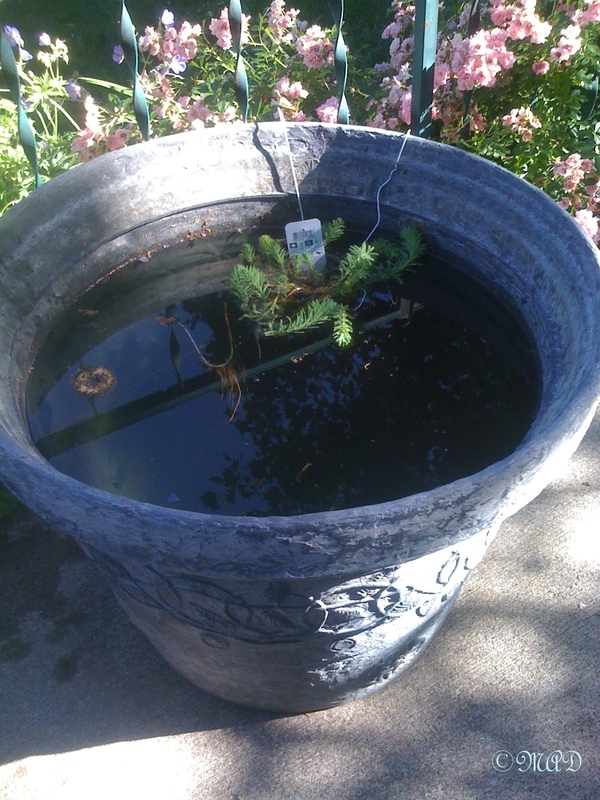 I filled it with water from the outdoor faucet, let the water sit for a day or two, added a little anti-algae mixture I bought at the garden center and put a mosquito dunk tablet in to float and kill off the larvae. 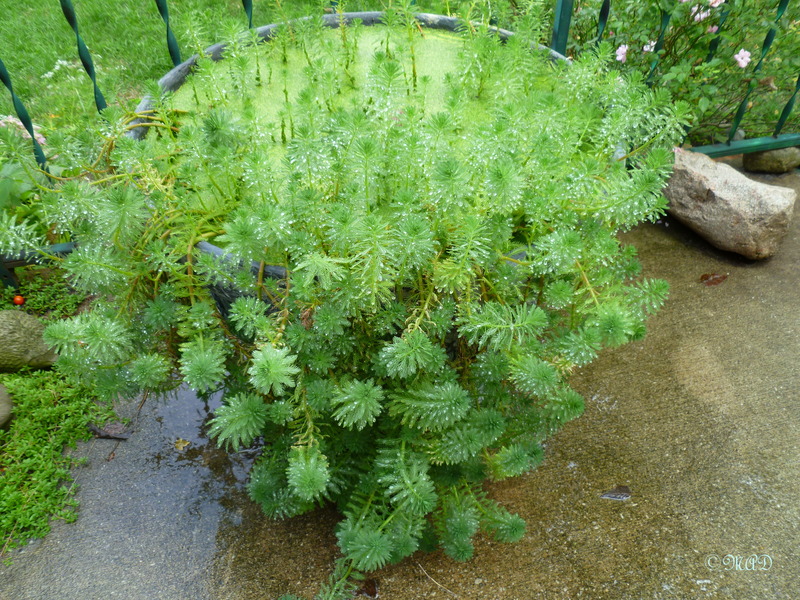 I put just two or three water plants in it, which I purchased at a garden center that specializes in water gardening (they can also be purchased online) – last year I had only 2, a little floating leaf plant and the one shown here at the beginning of the season. Both of them eventually grew to fill the whole container. It was its own microcosm with frogs and snails. Butterflies, bees and dragonflies came to quench their thirst. Some years I put a floating lettuce in it, which is fun to watch growing, dividing and making babies. It was just beautiful. These plants from last year were so soft and dewy, begging me to reach out and run my fingers along them. They were an oasis in my backyard, a place to sit and gaze, thoughtlessly. I‘ve got it empty and waiting to be filled with water and plants again this year. I can hardly wait to see it. This entry was posted in Gardening and tagged Water Gardening Fish Eden. Bookmark the permalink. Water is so calming and gives life to us all – what a lovely idea for a garden! Thanks too for visiting my blog. You’re welcome! Wish I could bring my water garden and live in France, lol. Great idea , I’m going to copy! What about sun/shade exposition ? I’ve just discovered your blog and thank you for following mine……. It doesn’t get stagnant if you make precautions: Use a little algecide (like you buy at an aquarium supply store), I only use about 1 teaspoon and also, once the plants are established and cover the surface of the water, the plants block out the sun needed by the algae to grow and hence, it does not grow. I never had any problem with stagnation or smell. The plants need to be fed occasionally and then you may need to re-add the algecide.